I was around 8 years old when I saw my parents involved in a silly argument. It was past my bedtime, and much like a sappy movie scene, I walked to them while dragging my favourite quilt along the floor. “When are you getting a divorce?” I asked, rather hopefully. My father laughed and wondered aloud why I would ask such an inane question. In hindsight, this moment summed up the first time a movie directly affected my subconscious. And the first time I realized what Robin Williams—a pudgy old caretaker woman who transformed into a desperate juvenile father at will—did for me. It was no coincidence that Genie in Aladdin—another defining character from my childhood—bore more than a passing resemblance to Williams’ quintessentially-underdog face: Lantern jaw, long nose, signature flappy ears, sunken cheeks, pleading eyes and the most tragic smile this side of a cocker spaniel. It was the sad droopy smile a smitten boy would forcibly wear while cracking lame jokes to make his girl laugh. He would believe it to be hilarious, and in turn, make his awkwardness break the ice. I remember that smile—that of a dysfunctional husband forcing it on us, when he reasoned with wife Sally Field in court in “Mrs. Doubtfire”. That wounded Oscar-winning smile when Stellan Skarsgard—his ex-friend and rival—mocked his romanticism in “Good Will Hunting”. Or that condemned smile of unrequited love when Annette Bening refused to get over her dead husband in the more recent “The Face Of Love”. I was too young to fully grasp the experience of watching “Good Morning Vietnam” and “Dead Poets Society” for the first time. Now I’m too old to watch it without being influenced by his following work. But I remember never being able to forgive the makers of “One Hour Photo”. They had taken my human robot (Bicentennial Man)—in my mind, a whacky invention of the lovable Dr. Kosevich (Nine Months), mutating my memories of Peter Pan into slimy Flubber, and turned him into a blonde-haired psychopathic lab technician. What made it worse is that he hadn’t really changed. Most of it was down to Williams’ own shape-shifting genius, but tell that to a dorky teen already struggling to adjust to Jim Carrey’s new dramatic persona. The barrier didn’t have to be broken in Williams’ case, because he was a naturally gifted performer blessed with an irrevocably needy face for a comedian. When he tried too hard, he wanted it to show—it was part of his act. All he had to do was smile more, which led to disturbing images of unstable characters in Insomnia and August Rush. For some reason, I was forever under the impression that he appeared in an early Batman movie as the Penguin or Ridder. This made sense because if you combine Danny Devito’s old-world gravitas with Jim Carrey’s hyperactive freakishness, you’d get Robin Williams. He was, in flesh and blood, the resurrection of Tragicomedy. Moreover, Robin Williams looked like a broken-hearted man. Whether he was actually one, I selfishly chose not to know. A sad man doing impersonations and silly voices to spread joy held a different kind of charm. It gave rise to a sort of hopeful laughter—not the kind of guffawing that follows stand-up comics who bring the house down, but the kind of restless smiles that made a troubled world a happier place. It was heartwarming, funny and poignant all at once. Perhaps this is part of his act too, I’d reason—a philosophy and way of life reminiscent of the old frail Chinese magician in “The Prestige”. Was he so committed to his craft? Was life his greatest act? “Bechaara (poor guy)”, I’d think whenever I’d saw his face on screen. And now I know why. He was that famous old uncle. Every family has one—the life and joy of every party and festive gathering. But nobody noticed that he arrived alone, and would always leave alone. Something very beautiful yet completely in cineaste space about this piece…. Like a requiem…. It has the beauty of the tragicomic. Thanks for putting this up ! 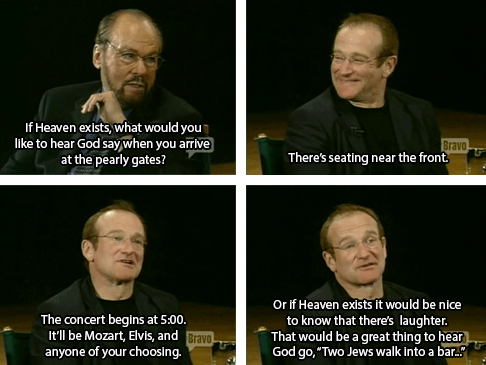 RIP Robbin Williams ! And that Dance in Bobby McFerrin’s ‘Dont Worry Be Happy’ Music Video, Even Robin Williams spread the same message.. through his Acting! !